Faneuil Hall Marketplace - also called Quincy Market - offers 100+ stores, artisan pushcarts, restaurants, and pubs right on Boston's famed Freedom Trail. 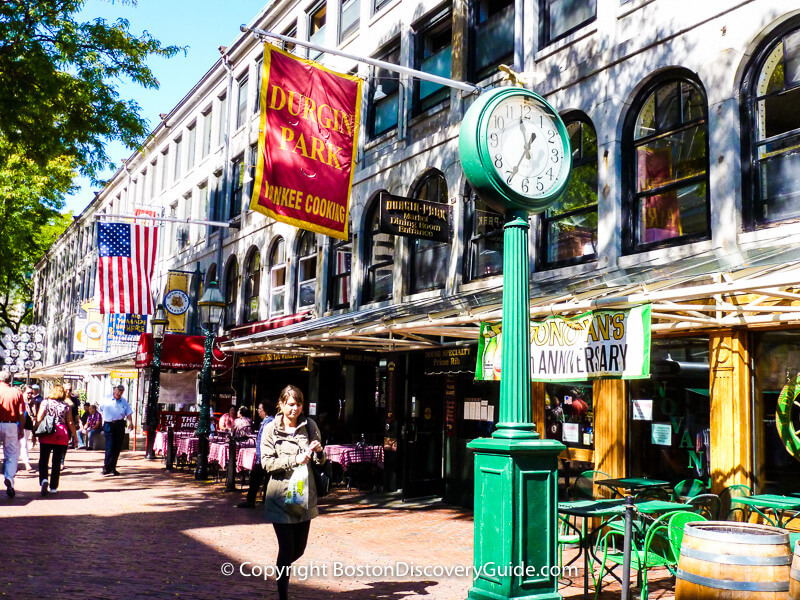 Faneuil Marketplace consists of four historic buildings dating back to the 1800s, including Quincy Market and Freedom Trail site, Faneuil Hall where the Boston Tea Party rebellion against British Taxation began. 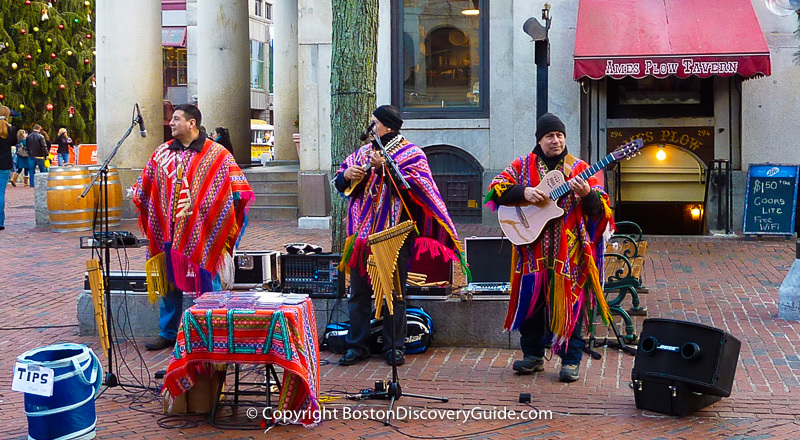 An appealing mix of local shops, international brands, street performers, top restaurants, pubs, and food stalls spill out onto the cobblestone plaza, a historic market area where merchants and shoppers have come together for almost four centuries. 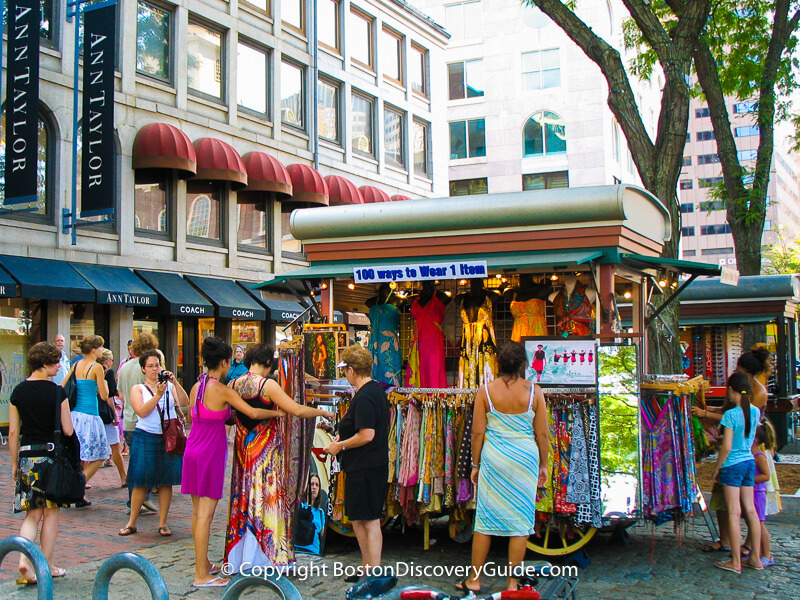 Today, Faneuil Marketplace is part shopping mall and part entertainment destination - and still a hub where people gather to relax, have fun, enjoy a meal or drink, and shop. The Marketplace's location in the heart of historic Boston means you'll find plenty of other interesting places to explore nearby: historic taverns, historic Haymarket (Boston's famous open air market), the new Boston Public Market, the haunting Boston Holocaust Memorial, and just steps away, the Rose Kennedy Greenway, the North End, and the Downtown Waterfront. You can easily spend a day here, especially if you combine it with a game or event at TD Garden or visit the New England Aquarium (both about 7-8 minutes away on foot). In addition, Faneuil Marketplace frequently sponsors special events, especially on weekends, as well as the spectacular Blink! light and music holiday show. 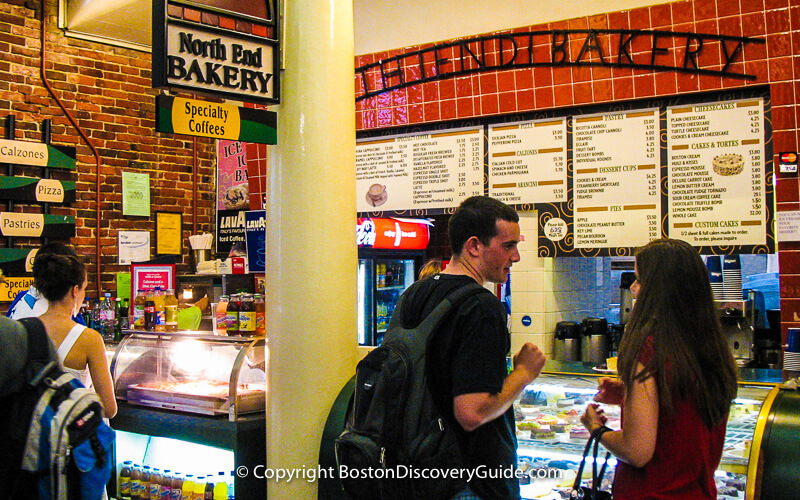 Most stores at Faneuil Hall Marketplace are in the North Market and South Market buildings. Faneuil Hall does offer some shopping on the ground floor, but the rest of the building is a historic site. Quincy Market contains a popular food hall - more about that in a moment. The North and South Market buildings include an interesting mix of up-scale favorites found in many shopping malls - look for Ann Taylor, Urban Outfitters, Uniglo, Coach, Victoria's Secret, Boxers to Go, Nine West, and Crabtree & Evelyn. But you'll also find a few not-so-typical regional and national brands here as well, such as The Black Dog, Newbury Comics, and Yankee Candle. 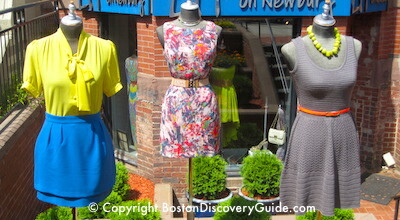 To appeal to tourists (as well as locals), there are also lots of Boston- and New England-oriented stores that you don't necessarily see elsewhere, such as Best of Boston, Boston Campus Gear, World Futbol Boston, Local Charm, Boston Tote, and 1630 Boston. What makes Faneuil Market really unique are the 40+ pushcarts, echoes of the market's Colonial past. These offer an interesting mix of Boston logo items, campus gear for local colleges, local artisan crafts, and other unique products. Also, keep in mind that the Quincy Market shops are right in the middle of one of Boston's oldest and most historic areas. Along nearby lanes and alleys with names like Merchants Row, Salt Lane, and Marsh Square, you'll find more small shops. Along and near the somewhat larger Union, North, and Blackstone Streets, you'll find even more businesses, taverns, and eateries. Out of the 50 or so places to eat and drink in Faneuil Marketplace, more than three dozen can be found in Quincy Market's Colonnade, the largest Food Hall in New England. Look for a mix of mouth-watering international options - Italian, Greek, Mexican, Asian - along with an excellent selection of pastries from Boston's North End, fresh local and New England seafood, and of course, excellent Boston pizza. Elsewhere in the Marketplace are more than a dozen other restaurants and bars, including a reproduction of Cheers and a couple of other Irish bars serving tasty pub food. Just a couple of blocks away, you'll find equally historic Union Oyster House (reservations recommended), several of Boston's historic taverns, and plenty of other casual places to dine. Blink! 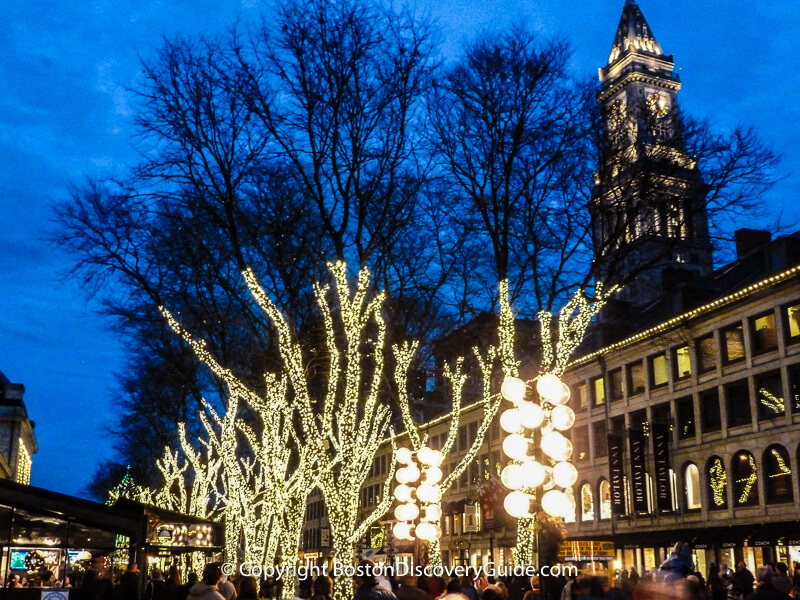 is Faneuil Marketplace's gala holiday light and music show, in which over 350,000 low energy LED lights blink and dance to music from Boston's Holiday Pops. Admission is free, and the show runs every half hour from late afternoon through the evening from late November through early January. Check our Boston Event Calendar for December for dates and times. And don't miss the Marketplace's huge decorated Christmas tree near the entrance. At almost 100 feet tall, it is the largest decorated tree in Boston. 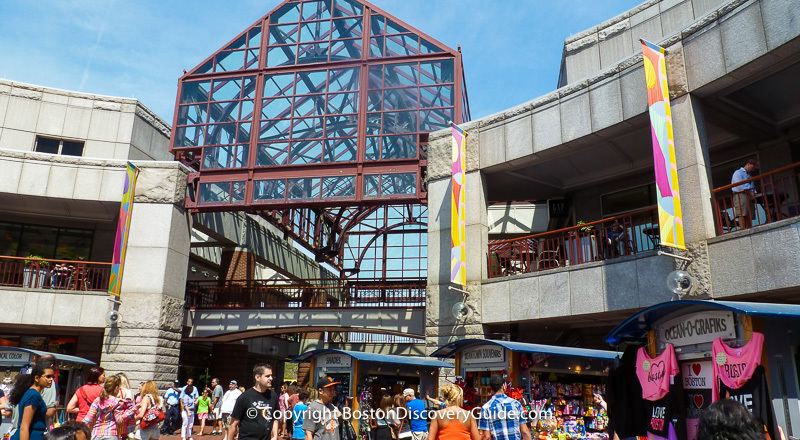 Hours: Most shops are open Monday - Saturday from 10am-9pm, and Sunday from noon - 6pm; many of the Quincy Market Food Hall stalls as well as the restaurants remain open later, as do many of the restaurants and taverns in the surrounding neighborhood. 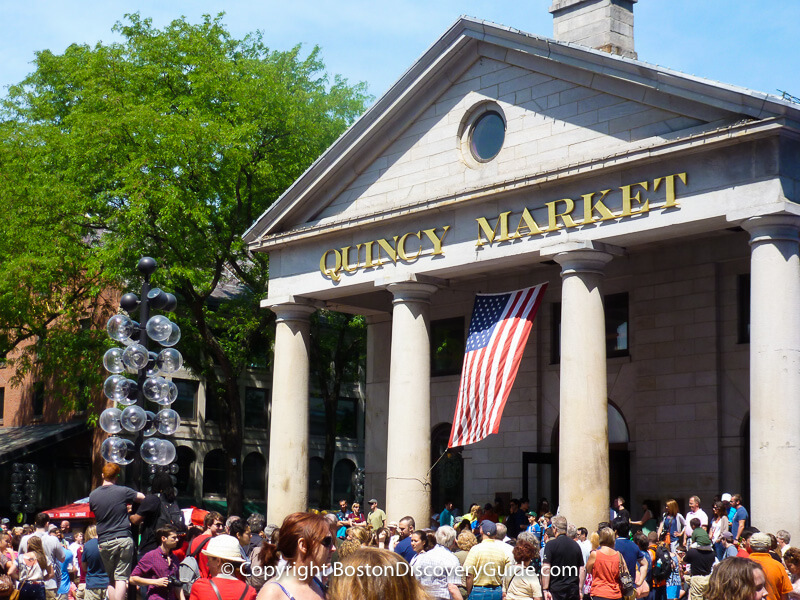 Almost from Boston's start in 1630, buyers and sellers have come together in the area where Quincy Market is located. After Faneuil Hall was built and donated to the city in 1742, other market buildings, warehouses, and shops began popping up in the same vicinity. The waterfront and docks used be just beyond where Faneuil Hall is located. Farmers, traders, merchants, and citizens congregated here to do business, load and unload ships, socialize, drink, and eat. By the 1820s, Mayor Josiah Quincy decreed that the city had outgrown Faneuil Hall and the surrounding buildings. Amid considerable opposition, he had inlets filled to create lots of additional land, docks moved, seven new and almost-new streets laid, and a splendid 2-story gray granite market building modeled on London's Covent Gardens erected. The Greek Revival building, with 22-foot Doric columns weighing 15 tons each, opened in 1826 and became known as Quincy Market (locals pronounce it "qwin-zee", rhymes with "twin-z"). Meat and produce vendor stalls lined the halls of the building - similar to what you see today, except now most of the food is cooked. By the early 1970s, Quincy Market, Faneuil Hall, and surrounding buildings were mostly empty and falling into ruin. The old restaurants and taverns remained open and vendors still sold produce at Haymarket, but much of the vitality had drained out of the area after the old West End was razed and replaced by government buildings and high-rise condos in the 1950s and '60s. To make matters worse, an elevated highway erected in the 1950s, the Central Artery, not only cut off the area (and the rest of the city) from the North End, but even worse, the highway towered over it, spewing noise and pollution. When Boston's Freedom Trail was established in the late 1950s, it included Faneuil Hall along with other nearby sites - thus luring tourists and locals to this part of the city. Kevin White, Mayor of Boston from 1968 to 1984, decided to revitalize the Faneuil Hall/Quincy Market area, and hired visionary developer James Rouse, sometimes called "the man who made cities fun again." Faneuil Hall Marketplace (the official name, although you'll hear "Quincy Market" more frequently, maybe because it's easier to pronounce and spell) was the first of Rouse's hugely successful "festival marketplaces." Boston's infamous "Big Dig" project removed the Central Artery in 2006, and this area is now pleasant once again. 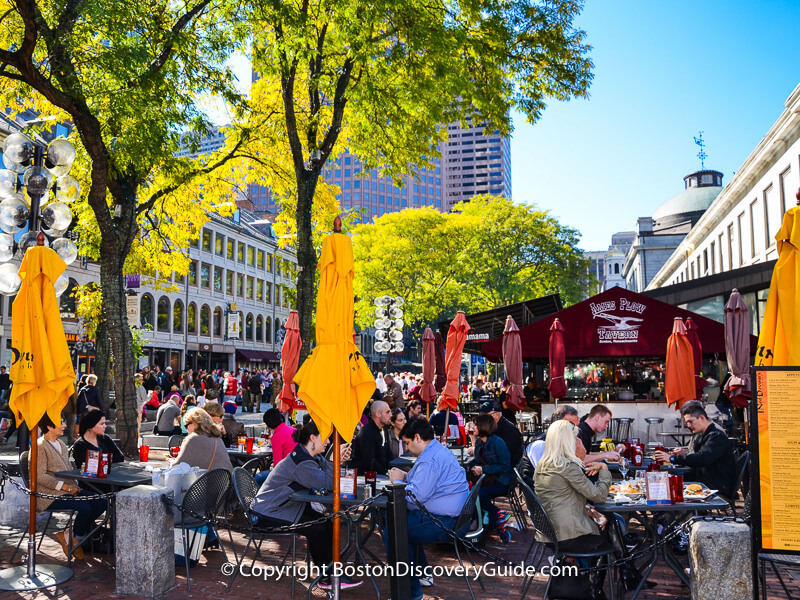 Today, you can see the grand entrance to Faneuil Hall Marketplace from the waterfront, walk to it across the beautiful Rose Kennedy Greenway from the North End, and enjoy the Marketplace - without the roar or smell of nearby traffic.